The exhibition’s official opening is on 13 April 2016, and will run from 5 April 2016 to 6 May 2016, open to the public 8am – 8pm Tuesday to Thursday; and 9.30am – 4.30pm Friday to Monday in the Oriel, at the Senedd. 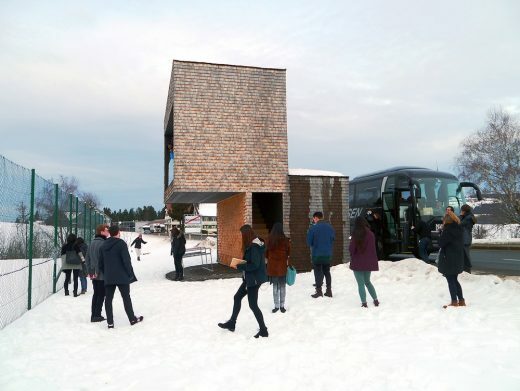 Can you imagine a bus stop made from timber logs on Cathedral Road or a futuristic Japanese-designed shelter on Westgate Street? These are just some of the architectural projects that will be featured in an international touring exhibition that visits Cardiff next month (5 April – 6 May). Focussing on promoting the transformational power of design through conversations about the culture of place-making, crafts and design in Wales, the Getting Things Done: Evolution of the Built Environment in Vorarlberg exhibition, showcases the architecture of the Austrian State of Vorarlberg, a region which has become famous for its well-designed towns, villages and buildings. In a bid to inspire and share best practice and encourage Wales to aspire to a similar design-led transformation, the Design Commission for Wales is supporting the exhibition’s stop-over in Wales in partnership with the Welsh School of Architecture. Over the last 50 years, Vorarlberg has developed a global reputation for its radical, yet sensitive approach to architecture, design and buildings, forming the subject of the exhibition, with more than 700 photographic illustrations and 230 projects on display. 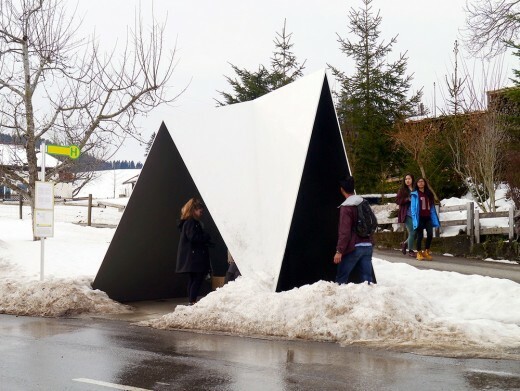 Carole-Anne Davies, chief executive of the Design Commission for Wales, said: “The Vorarlberg region in Austria is a shining example of the power of design and how our designers can create such a positive impact, enhancing the surrounding area and inspiring local people. “The combination of visionary building and planning approaches, investment in young, innovative architects and an aspirational government with open-minded residents has transformed the region into a leading design destination. “In the Getting Things Done exhibition, we want to showcase the projects that have enriched Vorarlberg in order to openly discuss and draw parallels with our own nation, placing value on traditional and innovative craft skills, investment into young designers and a sound understanding of local materials and landscapes. The exhibition demonstrates that everyday buildings and infrastructure provide valuable design opportunities – something we could learn from in Wales. 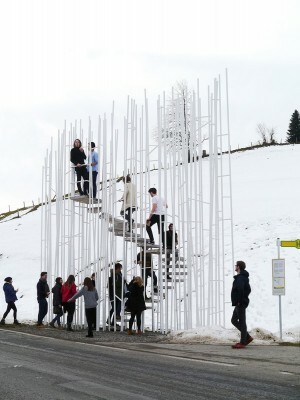 One recent initiative featured in the exhibition is the ‘Krumbach BUS:STOP’ project, which saw seven architects, from seven different countries, design seven bus stops in the small community of Krumbach. The architects worked closely with local craftsmen to use traditional materials and skilled manufacturing techniques in a bid to bolster the town’s annual influx of more than 30,000 tourists. Organised by the Austrian Cultural Forum London, in association with the Welsh School of Architecture, the Welsh Assembly and the Design Commission for Wales, the exhibition will be displayed in the Oriel at the Senedd, between 5 April and 6 May 2016. Following the official opening of the exhibition by Dame Rosemary Butler AM and the Ambassador of the Republic of Austria, Dr. Martin Eichtinger, on 13 April, the Getting Things Done symposium will be held on 28 April. The event aims to inspire discussions about the culture of landscape, materials, craft, environment and identity with a panel of architectural experts alongside the exhibition’s curator, Wolfgang Fiel. The exhibition is organised by the Design Commission for Wales, The Welsh School of Architecture, Cardiff University, The Welsh Assembly and the Austrian Cultural Forum, in association with the Austrian Embassy London, Constructing Excellence in Wales, Royal Institution of Chartered Surveyors and the Royal Society of Architects in Wales. The symposium, which features guest expert speakers has been crafted by Amanda Spence of DCFW and Steve Coombs of the Welsh School of Architecture and Coombs Jones Architects, will welcome Biba Dow and Alun Jones of Dow Jones Architects, Stephen Proctor and Andrew Matthews of Proctor and Matthews Architects, Jonathan Hines, of Architype and the exhibition’s curator, Wolfgang Fiel, to the Main Hall of the Pierhead building on 28 April 2016. To champion high standards of design and architecture to the public and private sector in Wales by promoting wider understanding of design issues and the importance of good standards in enhancing the built environment across all sectors. To promote design practice that is compatible with the Welsh Government Sustainable Development Scheme, promoting best practice in energy efficiency, waste disposal and public transport. To promote design practice compatible with the highest standards in relation to equal opportunity and promoting social inclusion. Give due regard to promoting excellence in day to day developments, like housing estates and industrial units, as well as promoting excellence in prestige projects. The Design Commission for Wales is a private limited company and wholly owned subsidiary of the Welsh Government.